What is Natural Systems Agriculture? A number of researchers at the University of Manitoba are interested in conducting agronomy experiments in organic crop production; however, we have been limited by the lack of organically-managed land. 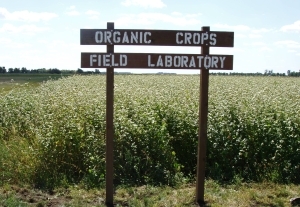 In response, the Organic Crops Field Laboratory was established in 2004 to provide a long-term site for plot-scale organic field crops research. Researchers involved are Dr. Martin Entz (research leader), technicians Keith Bamford, Anne Kirk, and Joanne Thiessen Martens, and various graduate and undergraduate students. The Organic Crops Field Laboratory is located at Carman, Manitoba on the University of Manitoba's Carman Research Station, which is operated by the Department of Plant Science (learn more about our Research Facilities). Two ranges of land, approximately 10 acres in total, have been converted to certified organic status. The landbase is divided into six parcels, about 1.5 acres in size, each containing a separate rotation crop. Each year, specific crops within each crop type are selected to be grown. A portion of each of the rotation plots can be used for research each year. This way, these research plots have a crop history and management approach that are typical of organic farms in this part of the prairies. Good soil and crop management are the keys to a successful organic crop rotation. Learning from our own experiences and the experiences of others, we have developed a management system that works very well at our Carman, Manitoba location. Our management practices, including varieties, seeding dates and rates, weed management strategies and more are described below. Yields of all green manures and grain crops for each year are also presented (see Table 1). A pea/oat green manure being rolled with the blade roller, July 2009. The rotation begins with a pea/oat green manure which is seeded in early spring and rolled with the blade roller in July. Varieties used are 40-10 forage pea and Leggett oat. This green manure crop has yielded an average 5300 lb/acre of dry matter. Assuming that 2.5% of the biomass consists of biologically-fixed N, the average N contribution of this green manure crop is 132 lb N/acre. We sometimes seed a catch crop in September after the pea/oat green manure in order to capture some of N and reduce N losses. In a wet production region such as Carman, late season N losses from leaching do sometimes occur. Organic spring wheat, July 2007. Spring wheat is seeded in early spring (late-April if possible) at a rate of 130 lb/acre. From 2005 to 2009, the varieties 5602HR or McKenzie were used, but in 2010 we began using Waskada. Wheat is generally harrowed at least 2x to control small-seeded weeds such as mustard, red root pigweed and green foxtail. A Lely weeding harrow is used, and harrowing takes place during the wheat’s juvenile stage (emergence to 3 leaf stage). Spring wheat yield has averaged 48 bu/acre. Assuming that each bushel of wheat uses 2.5 lb N, the average N removal by wheat is 120 lb/acre. In-crop tillage in organic soybeans, August 2009. Soybeans are seeded later in the month of May. Two preseeding tillage operations are applied to control early emerging weeds. The soybean variety OAC Prudence, a non-GMO type, is used. The soybean cropland is harrowed (Lely harrow) just before soybean emergence and again once the soybeans have reached the 2 leaf stage. 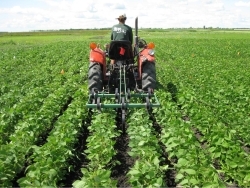 These weeding operations are important to the success of the soybean crop. 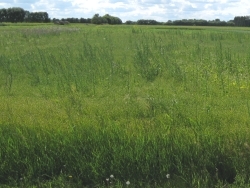 Wild oats were a problem in the soybean crop in 2009. These weeds were clipped 3x (cutter bar just above the soybean plants) in 2009. Interrow tillage is used several times during the season. Soybean yield has averaged 29 bu/acre. Barley / hairy vetch green manure, showing hayed treatments in background and rolled treatments in foreground. July 2009. Another green manure is grown in year 4 in an effort to replenish soil N supplies and provide weed control. A mixture of hairy vetch (seeding rate 30 lb/acre) and cereal (barley at 40 lb/acre) is seeded in early spring. No harrowing is used in this crop as the hairy vetch seedlings are sensitive to mechanical damage in their seedling stage. The green manure has been managed in two different ways; haying and no haying. 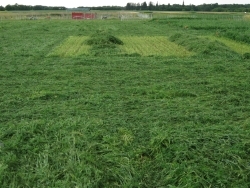 If the mixture is cut for hay in late July, hairy vetch will regrow provided that moisture is available. The yields for hairy vetch/cereal shown in Table 1 are for the non-hayed system. In this case, the green manure is rolled in late July and then it regrows in autumn to produce high levels of biomass. The average amount of dry matter at time of initial rolling is 6772 lb/acre, though in some years considerably more biomass is produced in autumn (moisture dependent). Assuming that 2.5% of this biomass is biologically-fixed N, the N supply from the biomass is 169 lb N/acre. This large pulse of N may pose a problem (i.e. N leaching or other losses) and current research is being conducted to address this potential problem. Organic flax, August 2009. This flax yielded 33 bu/ac. Flax is seeded in early spring at a seeding rate of 60 lb/acre. This is a high seeding rate, but we feel that high seeding rates are important to the success of the flax crop. Flax is not harrowed. The average flax yield is 22 bu/acre. Assuming that each bushel of flax removes 3 lb N, the total N removal by flax is 66 lb. This amount of N removal by flax is only one-half of the N supply from the previous green manure crop. We are considering other oilseed crops that use more N (eg., sunflower). The flax crop is followed by a cereal, either fall rye or oat. The average fall rye yield is 46 bu/acre while the average oat yield is 71 bu/acre. The advantage of fall rye over oat is weed control and reduced tillage. Fall rye crops are direct-seeded into flax stubble and few weeds are present in the rye crop at harvest. 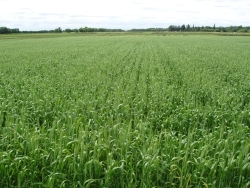 The low fall rye grain yields in 2009 were due to an unusual problem in that year – winter kill. Fall rye is susceptible to ice encasement – a problem which occurred in 2009 when a January rain and thaw followed by low temperatures resulted in an ice layer forming over parts of the rye field. 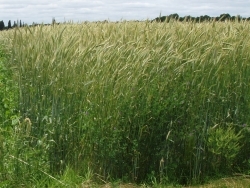 Oat crops tend to be weedier than rye crops. You will note a low oat yield in 2005 (18 bu/acre). This is what happened when we grow a disease-susceptible oat variety (AC Assinibioa) in an organic farming system. We have been using the variety Leggett since and diseases have been less of a problem – resulting in higher oat yields. Table 1. Yields of green manure and grain crops in the Organic Crops Field Laboratory, Carman, MB. Each parcel of land, or rotation block, can be followed through the table by following a specific colour. Where two crops are listed for a particular year, those crops were grown on two different parts of that rotation block. *In 2004, a pea/oat green manure was grown on all six rotation blocks. Since its establishment in 2004, the Organic Crops Field Lab has provided a home for many organic research projects, listed below. Follow the links to read more about selected projects. 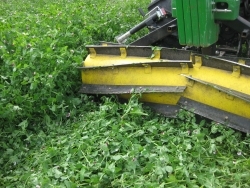 No-till green manure management (blade roller) (2006-ongoing) Watch video! This page created July 2005.